This time I am reviewing the AbleCommerce shopping cart. It is a Canadian company with about 11K active users and have been around for 15 years. It started back in 1994 under a different name, which seems like ages ago. They were a hosting company that wanted to add value to their customers by providing a shopping cart. It then evolved into what it is today. They offer both hosted and licensed versions. The price is an affordable $99 per month. If you choose to own the software and install it on your own server, that will set you back $995. They claim to be PCI compliance, so there should be no worries there. One of their strengths is their history and long term stability in the shopping card industry. Their big weakness is the lack of easy modifications without affecting the customer’s ability to upgrade to new versions. The cart is compatible with Authorize.net payment gateway, which is then compatible with most credit card processing companies. They do have a toll-free number to call, so that would allow US merchants to call them if they need assistance without incurring high long distance charges. This would be a requirement in my opinion for any Canadian or International company that wants to acquire US merchants. I have been in the credit card processing business since 2003. I have always wondered why the IRS never required processors to report the processing volume of its merchants. Well,that has all changed thanks to the IRS sneaking a requirement in the housing assistance tax act that was passed in 2008. Starting next year, your credit card processor will be required to report your gross processing volume. 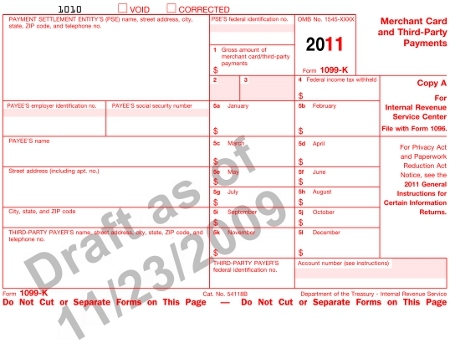 The new form will be called a 1099-k. The IRS will only see your gross volume. Any deductions like chargebacks and refunds will need to be deducted and is your responsibility. My question is what will the processing industry do? Will a lot of big ISOs start charging the merchants a new fee to help cover their cost to handle this new reporting requirement? Only time will tell, but I hope not. I do not know the logistic of it and how easy it will be. I am sure however if there is significant cost, many processors will create a new fee and past on the expense. So if you have been trying to get away by not reporting all of your gross sales, that day is coming to an end. FirstData is notoriously known for using a billing method known as BillBack or Enhanced BillBack. I recently spent about 10 minutes explaining this to two recent merchants that are currently on this type of billing with FirstData. This type of billing is great for the agent or merchant provider as it makes it difficult for the merchant to fully understand and know their processing cost which can reduce attrition with other competitors. However, it isn’t great for merchants on the other side of the table. This is how it works. 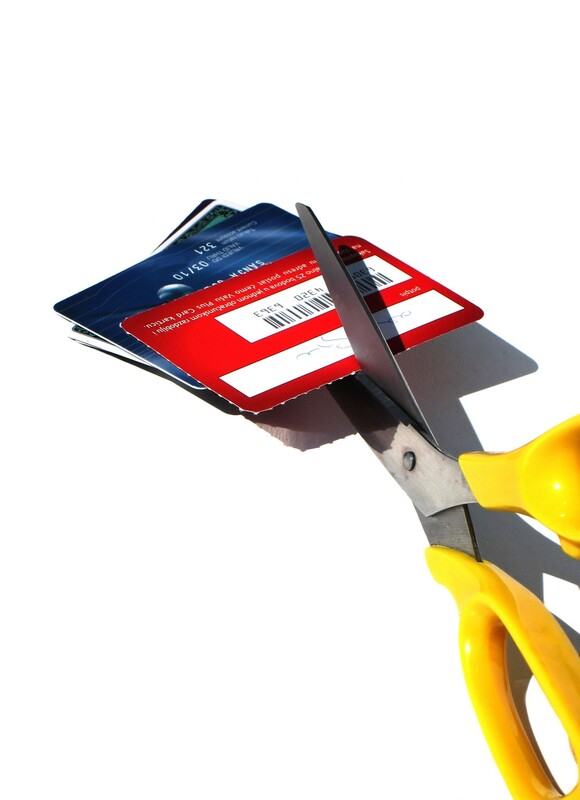 You are charged a flat percentage rate on all transactions regardless of card type. This is what you see on your current monthly statement. You are then assessed the “billback” for all the transactions that downgraded to the higher interchange rates, such as rewards and business cards. Here’s the tricky part. They place this BillBack charge on your next month statement. So January’s processing statement has BillBack charges for December’s processing! You essentially need two months of statements to figure out your true cost for a particular month as information is spread out between the two months. Enhanced BillBack is identical to the standard BillBack plan. The difference is the credit card processing provider adds an additional fixed percentage markup, hence the reason why they call it “enhanced.” It enhances their profits. Some agents including myself see this type of pricing alittle misleading to the merchant. This isn’t easy to recognize unless you know what to look for. Normally it is listed under a category called Interchange and you will see something like: Jan BB159 or Jan EBB159. The BB stands for BillBack and EBB is for Enhanced BillBack. This would also be on a February’s statement, since it says Jan, the previous month. Gotmerchant.com is pleased to announce that we are now able to offer integrated credit card processing within the QuickBooks software program. Merchants now have a choice in processing companies and not left with only one company to choose from (Intuit). There are other solutions available that have been around for years, but you must export the data into QuickBooks. What we have is totally different. It is a plug-in that you download onto your computer and works the same way as if you had the processing done through Intuit. So now you have choices in processing companies, which means you win as there is now competition. We are providing this software FREE of charge as a courtesy when you choose to do business with Gotmerchant.com. You must be running QB version 2004 and later. 2010 compatibility isn’t available yet, but should be released soon. From the user standpoint, there is no difference if you use us to processor your cards vs Intuit. The difference would be the level of personal service you receive and the pricing. Please review our pricing on our web site and I’m sure you will see that we advertise much more competitive pricing than the competition. Intuit®, the Intuit logo, and QuickBooks®, among others, are registered trademarks and/or service marks of Intuit Inc. in the United States and other countries. Gotmerchant.com is in no way affiliated with nor sponsored or endorsed by Intuit. Are you having a hard time taking your company to the next level? Are you currently taking advantage of the powerful referral business? I can’t speak for most companies in the credit card processing arena, but Gotmerchant.com puts 100% effort in obtaining as many referrals from current customers as possible. You can too and here are several ways of doing it. I will skip the reasons as to why you should go after referrals, but simply put, they are the best leads any business could ask for. 1. Be cautious with the timing of your referral request. 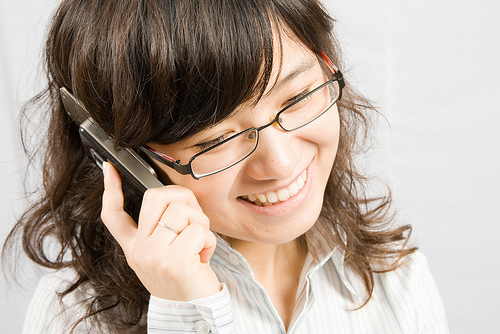 You want your customers to experience your service before you ask for referrals. 2. Always remember, not all clients are referral candidates, only about 20% generally are. 3. Offer incentives for your customers to refer your products or services. Such as, we offer our clients $50 for anyone they refer that signs up and gets approved. 4. Gotmerchant.com always sends out hand written thank you cards after a customer signs up. This may be a great time to ask for a referral. Also, be sure to ask for referrals whenever your customer needs assistance in the future and you have helped them with their problem. People love to spread the word about a company after they have fixed their problem for them. The recession is starting to push hard against the retail industry and is having a big impact on sales. 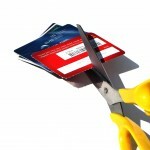 This usually has a trickle down affect for the credit card processing business. Many retailers are getting their chips in-line to be able to market itself efficiently during the new, tougher economy. This past holiday season was a good test for the retail industry on the new less is more buying mentality. Former JCP CEO made a statement that described this perfectly and I quote “I never saw anyone go out of business because they didn’t have enough of something.” So what are retailers suppose to do? You can only cut prices so low. Retailers should create themselves a niche or leg up over the competition. Such as JCP has created over 20 different private label brands that you will not find anywhere else. Having an exclusive brand keeps your customers coming back time and time again. Being green is another business concept that is on the rise as well. How retailers operate and the products they sell are becoming more green than ever before. Organic goods is one popular item that is increasing in demand. Many retailers like Wal-mart and Target are also incorporating as many green products as possible in their building’s designs when creating or renovating a store. It appears that JellyBelly.com is now offering its customers the ability to pay with a debit card in two ways. The first option has always been available and that is to process it like a credit card. The second choice has never seen the Internet era and that would be as a pin-debit transaction like you perform in a retail store. Pin-debit transactions have always been kept in a retail environment and never introduced to the Internet world because of security concerns. Honestly, I never thought this day would surface in the credit card processing industry. Merchants do save money by processing a debit card using one of the debit networks instead of Visa/MC, but the customers pin number is the only security the card has. For me, I don’t see how one would want to enter their pin number over the Internet to process a transaction. The transmission can be secure over the Internet, but it is the consumer’s computer where the vulnerability lies. The consumer’s computer could be compromised and anything they input with their keyboard or move with a mouse could be recorded by a hacker. One could probably say this is no different than banking online, but I’m not sure how consumers will take to the idea, if they will feel comfortable enough to enter their pin-number online. I suppose it is only a matter of time. I’m reviewing the VP-ASP shopping cart this time. The great thing about this cart is we are their featured merchant account provider! The cart allows for an unlimited number of users. It is one of the oldest carts on the market. It was developed in the 1990′s with Amazon & eBay and released in 1999. Since then, they have been constantly updating their software to meet the ever changing demands of Internet merchants. Even though it comes from Australia, its main customer base is the USA and UK. It is also very scalable and can support small merchants doing $20K to businesses doing $20 million a year. It doesn’t matter if you have 100 items or 100,000. It comes in two flavors, licensed based and semi-hosted option. The price starts at $295 for the basic version. According to VP-ASP, their biggest weakness is the shopping cart is open source, which they have missed out on more fancy technologies that are starting to hit the market. This all should change when they develop their new hosted version. 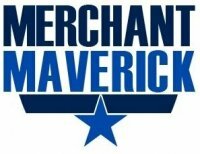 As I mentioned before, the best part about this shopping cart is they have partnered with Gotmerchant.com as their preferred merchant account provider.